This one's a little bit PilotWings, a little bit Wii Sports Resort. But don't worry. It's mostly PilotWings. 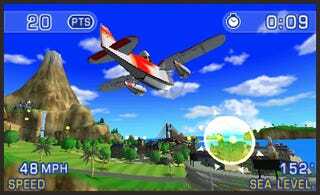 The classic Nintendo flight series makes a comeback on the 3DS with PilotWings resort, which has you flying around Wii Sports Resort's Wahu Island in not just a plane, but stuff like hang gliders and jet packs as well.